And you guys too of course! That just kinda goes without saying. Who feels like someone snuck and extra five days into this week? In other words it feel like it has been a really loooong long week. I've had an abscess on my wisdom tooth and for the past three days, (sorry I hope you've eaten) and I have literally felt like my head was going to explode. I honestly feel like such a proper goose when it comes to how I discovered the abscess in my mouth. In fact I can hardly believe I am about to tell you about this story because the truth be told - I feel like a complete moron who probably shouldn't be allowed to call herself a adult. It all started after I had been out to an event on Tuesday night... in the car on the way home from the event I said to Kate and Tessa that "my jaw actually aches from smiling so much tonight." We kind of laughed about it (which I have to say made it hurt even more) and then I went home to bed legitimately thinking I had somehow managed to strain my smiling muscles. Over the next 24 hours, the pain really hiked it up a notch or ten and I spent all of Wednesday night crying in bed. Actually I spent the night alternating between crying and punching my husband who was snoring so loudly and irritating my already agitated nerves. I finally took myself off to the doctors yesterday morning who informed me I had myself a rather nasty infected abscess in my mouth and then stuck a needle in my gum, whacked me on a whole lots of pain killers and antibiotics and sent me on my painful way. On another completely unrelated note, my infatuation with marble and copper and rose gold has not subsided even the slightest bit since I developed my pre-Christmas obsession. 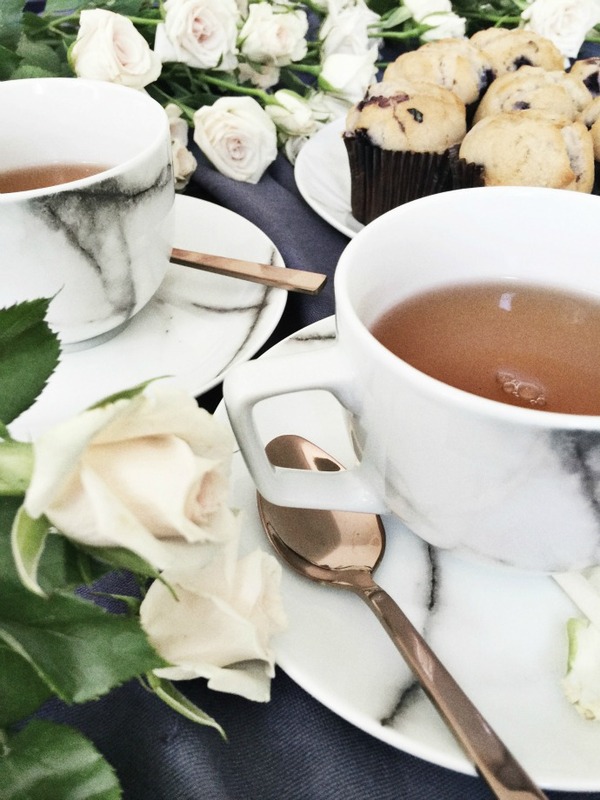 If anything, it has deepened... mostly thanks to these gorgeous marble teacups and saucers and rose gold tinted teaspoons I was sent from Salt and Pepper. I love them so hard that I decided that they were completely worthy of their own little styled photo session, followed by a fancy shmancy afternoon tea for my kids and I when they got home from school. Two of my boys thought I had completely flown the coop for even suggesting such a girly affair but happily scoffed the muffin props anyway. The other child asked if we could also have margaritas. Yes, I clearly need to address that. 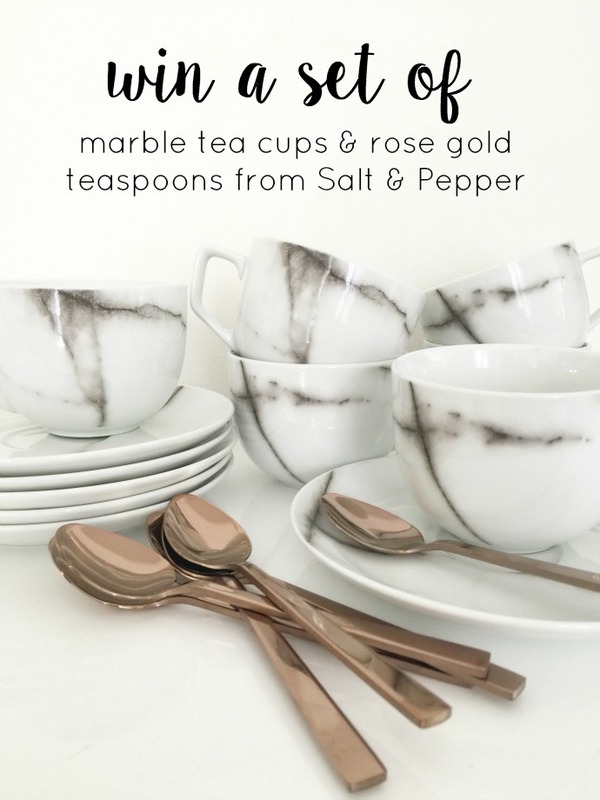 Marble and rose gold is totally hot right now when it comes to home wares, and Salt and Pepper has such a gorgeous range to support this trend including everything from dinnerware to clocks and vases. You can purchase Salt & Pepper's various goodies from a huge range of stockists, but the easiest thing to do is enter your postcode here and find a stockist close to you or one that home delivers like Domayne. You can also follow Salt and Pepper on Instagram and Facebook to stay up to date with their newest releases and styling and decorating tips too... or just simply drool over their gorgeous imagery. Now of course I am not going to flash my fancy pants teacups and spoons all over the blog without having a set put aside for one of you guys to win for yourself right? 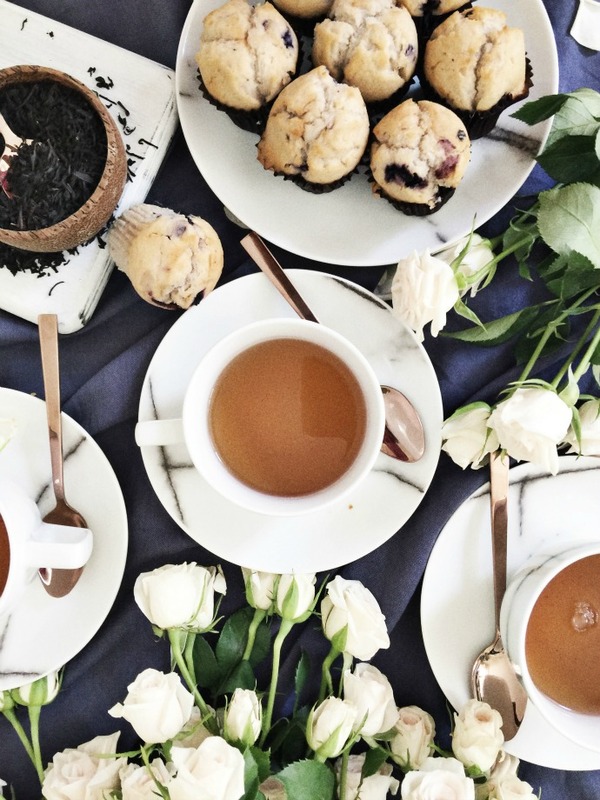 The lovely team from Salt and Pepper agree with that too and so they have given me an extra set of 6 marble tea cups and saucers and 6 rose gold teaspoons for one of you guys to win too. All you need to do to enter is leave me a comment telling me whats your favourite tea ritual. I mean we all have one don't we? 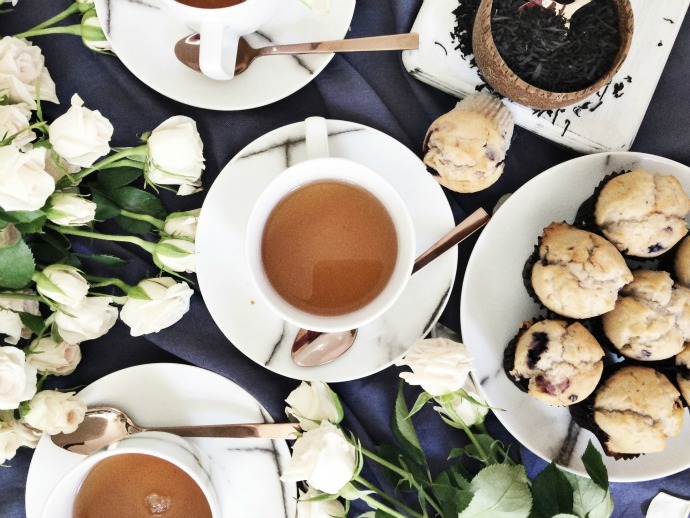 Do you like to act all civilised when you drink tea - with proper table cloths and yada yada? Do you prefer with your feet up and and drinking your tea whilst reading a magazine. Do you guzzle it on the go, reheating it two or three times before giving up? Or do you hide something else in your teacup ... like some coping cordial? Tell me - What's your tea drinking ritual?